THANKS FOR TAKING A LOOK. 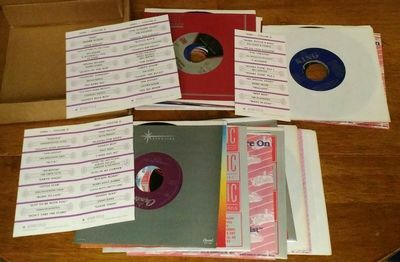 >>> I recently acquired a collection of boxed (plain brown cardboard) UNUSED jukebox 45 and 78 records with the UNUSED jukebox strips that I will be listing over the next couple of days. So make sure to take a look at my other listings. <<< The jukebox strips by Star Title have "1950's - Volume II" at the top. Some of the records are in plain white sleeves and others are in the correct record label sleeves. Some of the sleeves have lite scuffs or corner wear but for the most part the sleeves are nice. >>> THE VINYL IS ALL MINT AND UNUSED. SUPER SHINEY AND CLEAN. A FEW OF THE RECORD LABELS HAVE SOME WEAR FROM BEING IN THE BOX AND RUBBING TOGETHER OVER THE YEARS. NOT SURE BUT I'M PRETTY SURE THESE RECORDS ARE FROM THE EARLY 1970's. <<< The title strips tell you what is here in this set. The pictures aren't that great to see what the record companies so here is a list not in order of the pictures. Elvis Presley Collectables - The Mystics Laurie plain sleeve - Bobby Day Collectables - The Crew Cuts Mercury plain sleeve - Patsy Cline Collectibles - Johnnie & Joe Eric - Paul Anka Eric - The Kingston Trio Capitol - The Elegants MCA - Jimmy Jones Eric - Jim Lowe King plain sleeve - Frankie Avalon Eric - The Danleers Collectables - Mello Kings Collectables plain sleeve - Conway Twitty Polydor plain sleeve - Johnny Crawford Original Sound plain sleeve - Pat Boone MCA - Neil Sedaka RCA - Bobby Darin Atlantic Oldies Series - Lavern Baker Atlantic Oldies Series - Bill Doggett King plain sleeve - The Playmates Roulette plain sleeve - Bobby Helms MCA - The Shields Collectables - Bill Haley MCA. Very cool group to add to your collection. Well worth the "Buy It Now" and FREE SHIPPING. I have a 30 day return policy so buy with confidence. You won't be disappointed with this item. Buyer gets well packed FREE Shipping with Delivery Confirmation within the USA. Paypal preferred. Please e-mail any questions.